At SBC there is a single price that covers tuition and meals, but lodging must be paid for separately through Cerveny Conference Center (see section on lodging below). There are several housing options, each explained in detail in the “Stay on Site” tab. The options are: guest room single occupancy, guest room double occupancy, cabin bunk, RV site, tent site, and commuter. **Hotel Options**: we now have a special arrangement for our students with the Holiday Inn in Live Oak. In addition, Cerveny Conference Center has a arranged for a group rate at Fairfield Inn & Suites (also in Live Oak). See below for details. Note: Starting this year, lodging must be paid for separately via a separate payment “platform” (see below). Commuter rates for tuition and meals are the same as for resident students; the only difference is that you simply do NOT need to sign up for on-site housing. This said, please be sure to check the “commuter” box on the registration form so we know that in your case lodging is not required. Half Price!! We offer a special arrangement for non-playing spouses, chaperones and companions of registered students. The spouse/companion/chaperone pays half the regular price for tuition and meals. The spouse/chaperone/companion rate entitles them to the full meal plan and access to demonstrations, jams, and concerts. They may not attend classes. Every non-playing spouse/companion/chaperone must fill out a separate registration form. Lodging Arrangement for Spouse/Companions: Given the new arrangement for lodging payment, we can no longer offer a half-price arrangement re lodging at camp. Spouse companions who stay on site will have to sign up for housing separately and pay the full lodging price. Note: we may need to limit the number of spouses and companions. If we begin to run out of space for additional registrants at Camp, we reserve the right to prioritize the admission of regular students. If your spouse/companion plans to simply stay in an on-site lodging space, RV, or tent through the weekend without signing up for meals, attending concerts or having any other contact with the camp, they do NOT need to register for camp. You do need to supply us with their names and emergency contact information, however. You must also pay $10 per calendar day “use fee” for each such participant, a sum that simply gets passed along to the Conference Center. 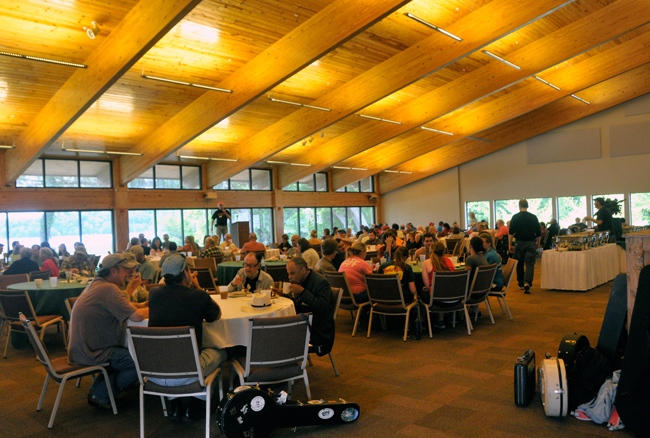 You must reserve and pay for your lodging directly through our host, Cerveny Conference Center at Camp Weed. Here’s the procedure. First register for camp. We then send you an acknowledgement email, which also contains a Cerveny Lodging Link. Use this link to reserve and pay for you on-site lodging. You have a choice of single and double occupancy guest rooms, RV sites, cabin bunks, or tent camping (see below for details). You will also have the opportunity to specify roommates, ask for handicapped friendly rooms, etc. Note that “Full-Camp” refers to three nights’ lodging (Thursday thru Saturday) and “Weekend-Only” refers to two nights’ lodging (Friday and Saturday). Full descriptions of each kind of lodging appear in the “Stay on Site” tab. Here are the answers to what we expect will be the “FAQ” about the current housing sign-ups arrangement. Deposits. You may reserve a lodging unit at Camp with a deposit of 25%; it is also fully refundable until 72 hours prior to the start of Camp. Roommates. The Cerveny payment platform allows you to specify a guest-room roommates, or ask to be assigned a double occupancy roommate. Handicap-Accessible. You will have an opportunity to indicate special needs. Lodging reservations are assigned on a first come, first served basis. 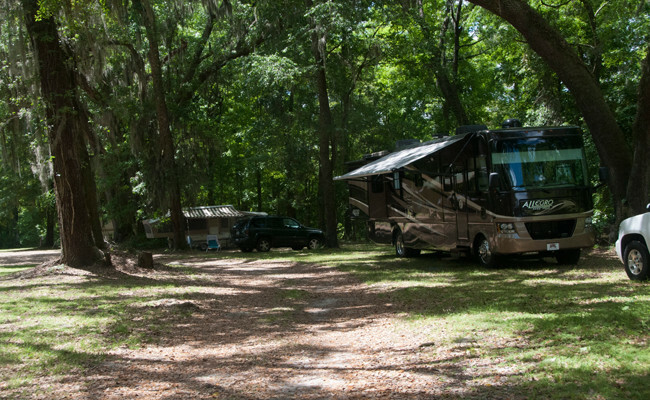 There are only a limited number of guest rooms and RV sites and experience tells us they will go fast. If you want to assure yourself of a guest room or RV hookup reservation, please sign up early!! Please Also Consider Our Great Cabins! 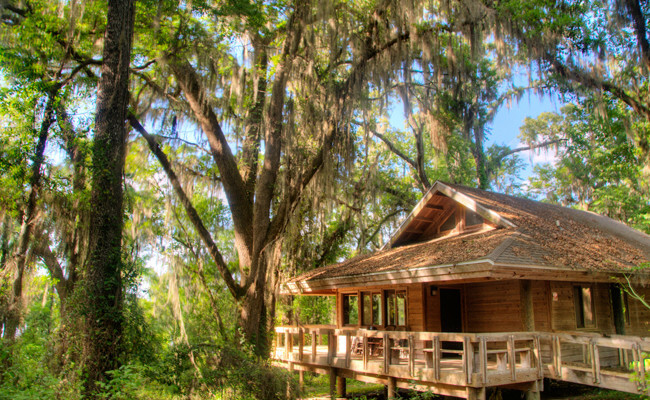 Our cabins are clean and comfortable, with electricity, a/c, and indoor plumbing. Areas within each cabin are separated by built in cabinets, so that there is some privacy. Please also keep in mind that if you participate fully in our program, you won’t be in your rooms very much (aside from sleeping)! *Note: Cerveny Conference Center has not always been quick to get back to people re housing inquiries. If they don’t return your call within 24 hours, contact SBC directly. We’ve reserved a block of rooms at a discounted rate for SBC students at the Holliday Inn in Live Oak. If our guest rooms are full, students who prefer motel-level accommodations may elect to reserve a room at the Holiday Inn, which is roughly a 10-15 minute drive from our site. The rooms are very nice and were recently renovated. They have a pool and also offer free breakfast. Students who stay at the Holliday Inn should register at the commuter rate. If you elect to eat breakfast at the Inn and let us know via email by March 1 , 2019; we will refund that portion of tuition that covers Camp breakfasts. Breakfast refunds will be made at check-in and amount to roughly $10 per meal. Cerveny Conference Center has arranged for a group rate at another Live Oak hotel, namely Fairfield Inn and Suites. Youngsters often get a tremendous kick-start by being exposed to great players and to the exciting atmosphere of a banjo camp, but they often have trouble finding the resources to attend. In an effort to remedy this state of affairs — and help ensure the future of the music we love — we have established a youth scholarship fund aimed at helping to bring more folks under 25 to Camp. If you can afford to contribute $25, $50, or even $100 to this cause, please fill in your amount in the appropriate box on the registration form and your donation will be automatically processed. Until January 22, 2018, you may reserve a spot at Suwannee Banjo Camp with a $100 tuition deposit. If you reserved a spot with deposit; your tuition balances must by paid in full by January 22, 2018. After January 22, 2018, all new registrations must be accompanied by full tuition payments. Note: Due to a feature of our payment platform, when you select “pay a deposit,” $100 will be automatically charged to your credit card. You can NOT offer to pay any other amount. If you pay by check, however, you can of course pay a deposit of any size. Minor students may attend SBC if accompanied by a parent or other responsible adult. Parents must sign a permissions form that allows their child to attend (please contact us and ask us to send a Youth Permissions Form). If a non-parent acts as “guardian” at Camp they must have signed permission to do so from a parent. Parents or Camp-Guardians may register as students, but if they do not wish to fully participate in Camp they may register for SBC at the “non-playing spouse/companion” rate (see above). Our catered meal plan for the full camp covers all meals from dinner on Thursday, March 21 through lunch on Sunday, March 24. All meals will be prepared by the outstanding Cerveny Dining Facility. There will routinely be omnivore and vegetarian options at each meal. Cerveny can also provide vegan meals, and provide meals for those with restricted or special diets. Please let us know on the registration form under “special needs” if you require a special diet plan. Students may opt out of the regular camp meal plan only by special request. All meals from dinner on Friday evening through lunch on Sunday are provided by the Cerveny Dining Facility. Note: the weekend-only plan does NOT include Friday lunch, but Friday lunch may be added as an option (see below). The weekend-only meal plan begins with Friday dinner. However, students registered for weekend-only may opt in to the catered Friday lunch provided for Full Camp participants. The cost is $13.50 per person. Just check the appropriate blank on the registration form. For those unsure of the distinction, entrees classed as “vegetarian” often contain eggs or dairy products such as milk or cheese. Vegan meals contain no animal products whatsoever. Register Online Today! 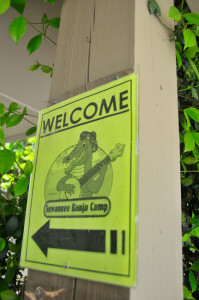 Banjo Camp students have several lodging options. At Camp Weed, we have room for all students to stay on site and we strongly encourage all students to stay on-site. However, students may elect to stay off-site at a private home or motel/hotel, and come to camp as commuters. Note: this year, we have a special arrangement with the Holiday Inn Express in Live Oak. In addition, Cerveny Conference Center has arranged for a group rate at Fairfield Inn and Suites, also in Live Oak. You must reserve and pay for your lodging directly through our host, Cerveny Conference Center. Here’s the procedure. First register for camp. We then send you an acknowledgement email, which also contains a Cerveny Lodging Link. Use this link to reserve and pay for you on-site lodging. You have a choice of single and double occupancy guest rooms, RV sites, cabin bunks, or tent camping (see below for details). You will also have the opportunity to specify roommates, ask for handicapped friendly rooms, etc. Deposits for lodging. 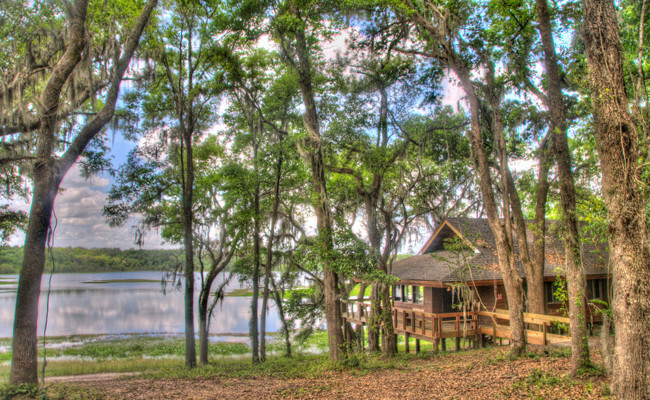 You may reserve a lodging unit at Camp with a deposit of 25%; it is also fully refundable until 72 hours prior to the start of Camp. Note: Cerveny Conference Center has not always been quick to get back to people re housing inquiries. If they don’t return your call within 24 hours, contact SBC directly. Lodging reservations are assigned by us on a first come, first served basis. There are only a limited number of guest rooms and RV sites and experience tells us they will probably go fast. If you want to assure yourself of a guest room or RV hookup reservation, please sign up early!! There is still plenty of room in our cabins, RV sites, and campground, but as of 12/20/18 our on-site “Guest Rooms” (motel-level accommodations) are just about fully reserved. Students set on Guest Room level accommodations have several options. Go on the Guest Room waiting list, maintained by Cerveny Conference Center (call 386-364-5250 and ask for Gina). For advice on finding the site, climate-appropriate dress, bedding, what to bring, etc. check out the Camper Tips menu item! Please be sure to read this advice prior to coming to camp! We have a limited number of motel-level residence rooms – called Guest Rooms – right on site. The guest rooms are very comfortable with double beds, “en suite” bathrooms and individual climate control. They are all a very short walk from most of our classrooms and the dining hall. They are close to the center of the action, but still well out of earshot of late night jammers. Students may sign up for either single or double occupancy. If you sign up with Cerveny Conference Center for double occupancy, you may either suggest a roommate or ask them to assign you one. Cerveny has six handicap accessible guest rooms. Please specify upon registration if you will require a handicap accessible room. There are only a very limited number of guest rooms, so if you wish to reserve one be sure to sign up early (in 2016 they were all reserved by the end of November)! There is a waiting list for guest-room accommodations after all guest rooms have been reserved. To get on the list call Cerveny Conference Center and ask for Gina. You are encouraged to register for camp with alternative lodging (cabin bunk, RV, tent camping, or commuter); then we can switch you into a guest room after it comes open and adjust payment accordingly. We’ve reserved a block of rooms at a discounted rate for SBC students at the Holliday Inn Express in Live Oak. Once the guest rooms are full, students who prefer motel-level accommodations may elect to reserve a room at the Holiday Inn. The rooms are very nice and by next spring will all be newly renovated. They have a pool and also offer free breakfast. Students who stay at the Holliday Inn register at the commuter rate. If they elect to eat breakfast at the Inn, and let us know well ahead of Camp, we will refund that portion of tuition that covers breakfasts. Breakfast refunds will be made at check-in and amount to roughly $10 per meal. The Holiday Inn Express is roughly a 10-15 minute ride from our site. 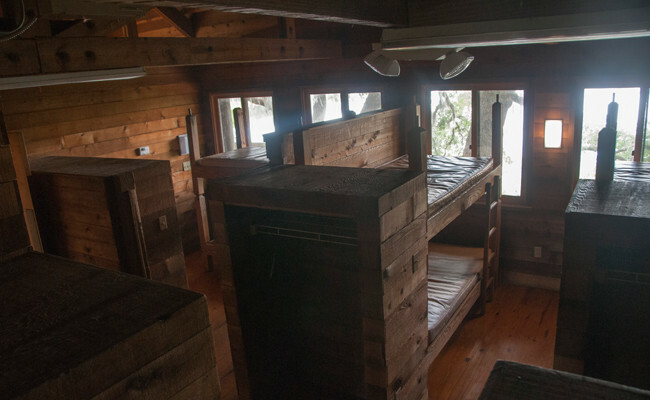 We have plenty of beds in relatively modern cabins that have electricity, heat, air conditioning, and indoor plumbing. Each cabin will have a maximum occupancy of nine students (note: we assign lower bunks only). All cabins are handicap accessible. Each cabin has 3 showers, 3 toilets and a 2 sink vanity. 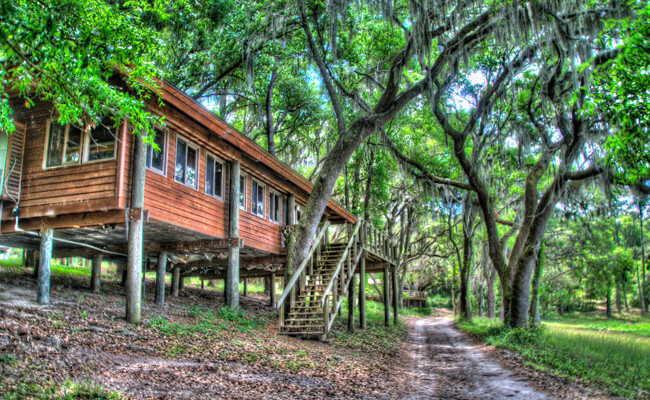 The cabins are located in scenic wooded areas. Cabin residents will need to walk a few minutes through the woods or along a road to get to the dining hall. A few classrooms are close by, but most of them are near the dining hall and require a few minutes of walking. Note: Areas within each cabin are separated by built in cabinets, so that there is some privacy. Please also keep in mind that if you participate fully in our program, you won’t be in your rooms very much (aside from sleeping)! Note: Guests staying in the cabins must bring their own twin-size sheets, linens, towels and toiletries. 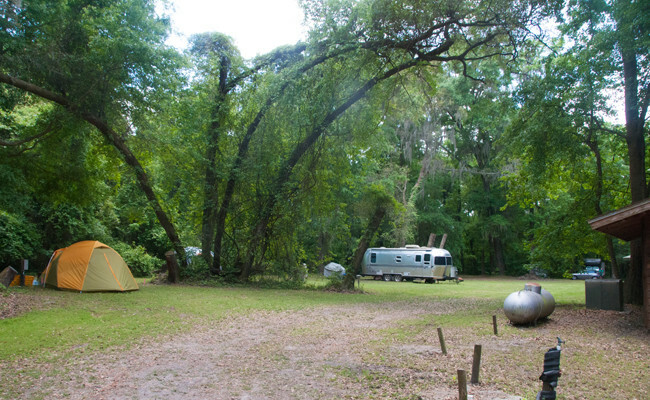 We have a limited number of RV hookups available plus plenty of space for tent-camping. 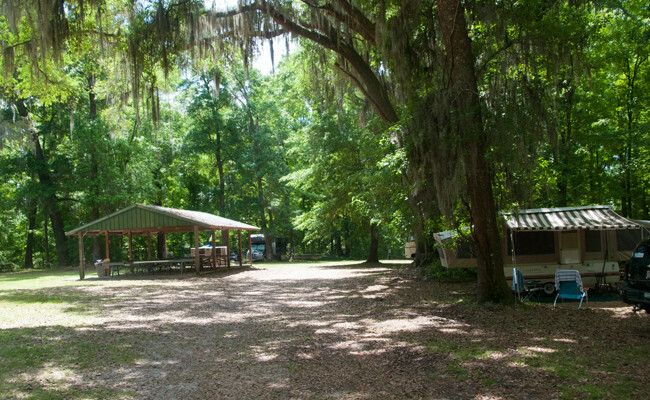 There is a conveniently located bath house with male and female sections that is available to both RV and tent residents. 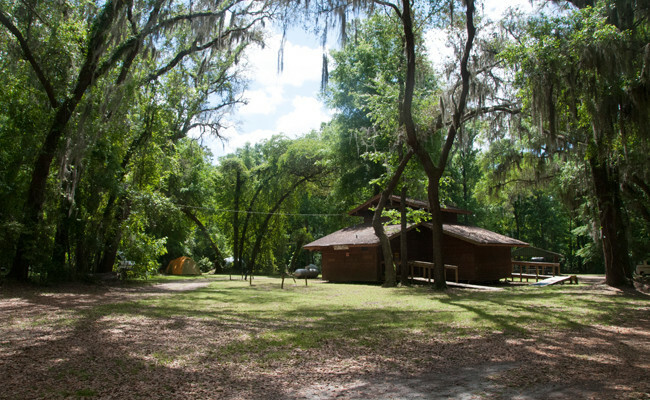 Note that it is a good 10-15 minute walk from the RV and tent site to the main classroom area. Those staying in the RV/tenting site might consider bringing along a bicycle or planning to negotiate this short commute via your car. Note: The RV and tenting area has picnic tables and other amenities; some great jam sessions have sprung up there in the evenings. We’ve reserved a block of rooms at a discounted rate for SBC students at the Holliday Inn in Live Oak. If our guest rooms are full, students who prefer motel-level accommodations may elect to reserve a room at the Holiday Inn. The rooms are very nice and by next spring will all be newly renovated. They have a pool and also offer free breakfast. Students who stay at the Holliday Inn register at the commuter rate. If you elect to eat breakfast at the Inn, and let us know by March 1, 2019, we will refund that portion of tuition that covers breakfasts. Breakfast refunds will be made at check-in and amount to roughly $10 per meal. There are three sizable motels right in Live Oak, Florida, in addition to the Holiday Inn Express. In addition, quite a number of motels, etc. are to be found in and around Lake City, Florida, less than half an hour away. Note: Because there are sometimes large regional events in April that draw crowds (such as stock car races), be sure to make your motel reservations early.